Pip Wilson bhp: Gout - Cramps - Urine Infection - Emotions - Health of body - I kid you not! Gout - Cramps - Urine Infection - Emotions - Health of body - I kid you not! I find the text above interesting and relevant to this human frame. I have had recently, for the first time in my life, a urine infection. It was so painful - like peeing broken glass. (A dose of antibiotics got rid of it in a week - thank you NHS). In the past I have had gout real bad. In times past I couldn't walk - just crawl around indoors! A duvet at night being too heavy on my swollen foot. I once was hit badly when working in South Africa and I have had to learn how to manage it. Now that I am managing all that I have a newest battle with leg cramps. These usually hit me after I have been conducting facilitation/training - when I am passionate in communication. Even after my 121's too ! KID YOU NOT - I have had to learn about kidneys. Mine seem older than me because they are not doing their job well and I am considering their job description! I need to learn to live with them - joking apart. BUT I find it interesting, as a guy who is passionate about emotions - feelings - emotional intelligence and how we communicate & connect with others especially in helping relationships. 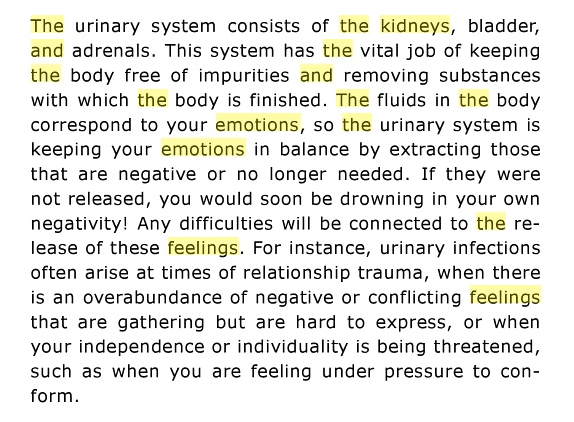 The adrenal gland sit on top of the kidneys and they seem to party together - certainly interact as the article above indicates. I am no Proff on this stuff but I know that my body reacts when emotions are running high. So this FEELINGS stuff is not just about personal development - getting to know our inner being - it is also massive when it comes to our PHYSICAL HEALTH. Take care you young guns - look after that one and only precious body of yours. Don't NUMB it with drugs or spirits! Don't neglect your emotional development. You are beautiful - stay with us as long as possible.